Now that you know the best ways to rake in 5-star reviews, it’s time to talk about what not to do. Whether you are a seasoned host or new to the realm of hospitality entirely, it’s important to note the distinction between a good listing and a not-so-great one. You only have a few seconds to grab a vacationer’s attention, so use your words wisely. Here are 14 things you should never use in your vacation rental listing. “Expect Your Dream Home” Guests’ expectations can be rather high when it comes to taking a timeout from life. Often, renters have very specific assumptions of what their experience will be like and it can be difficult to meet those expectations. As such, disappointing guests is not always due to an oversight of the host. You can help your renters set realistic expectations in the rental description by leaving out the word “expect.” This way, there is less risk of a letdown. The word may stir up some kind of anticipation, either good or bad, and can often leave potential renters with a bad taste in their mouths. “Keep kitchen cupboards closed due to broken hinges.” It’s unwise to use this word! It might seem like a very obvious mistake, but it’s still important to mention. Again, this is where tact comes into play. While there is value in telling the truth, there comes a time to re-evaluate. If the toaster breaks, discard it. If it’s not possible to replace right away, simply edit your rental description to take out any mention of a toaster. It is very important to remember to update your listing. Any misleading information (even the smallest thing, such as listing an appliance that is actually not usable) can very easily cause disgruntled guests or bad reviews. “Friends Will Be Jealous of this Spectacular Getaway” This is probably true, especially if your listing is a bungalow by the sea. While this word may seem like a way to draw renters, on second glance, it doesn’t offer them much. Making friends jealous is a plus, of course, but it’s probably not the main reason people are looking at the listing. Booking a getaway is for getting away, not making people jealous! Stay on point and keep the message relevant to the end goal of filling up your rental calendar. “We are sorry to say no pets allowed.” This is a polite enough statement, but what is there to be sorry for? A no-pets rule is perfectly acceptable and understood among renters. In conversation, saying “No pets, I’m sorry,” is another thing entirely. A professional rental description should stick to the basics, including any ground rules you’ve established for your tenants. Keep the language friendly and open, but there is no need to apologize for any necessary conditions. “Please leave your pets at home” is polite, names a rule, and is respectably stated. “You’ll find everything you need.” The word “everything” gets thrown around a lot when it comes to vacation. While it may not seem like a big deal, promising “everything” to your guests can set you up for trouble, as you could be setting yourself up for an opportunity to under-deliver. Instead, make promises to do your best to provide for a guest’s needs. Create an opportunity to over-deliver instead of the opposite. “Get Ready for a Good Time” / “There’s a great beach a short walk away.” It’s easy to fall back on “good” and “great” to explain your vacation rental or the locations near them. However, it’s also easy to overuse these words. The English language is full of other descriptive words, so branch out a little. Instead of saying, “There’s several great restaurants nearby,” opt for, “There’s several delicious restaurants nearby.” Instead of saying something is “good,” explain that it’s “fantastic,” “superb,” or “exceptional.” Get creative! Any word that is misspelled should never be included in a listing. In the age of Spell Check, misspellings should not be overlooked. There are times even technology misses a thing or two, which is why it’s important to proofread – more than just once. Inserting local jargon can seem like a fun way to engage renters, but – especially for foreign guests – this can be a bit confusing. Stick to general terms and language, but if there is something specific to the listing that needs to be included, be sure to offer some kind of explanation or insight as to what it means. They say “a picture is worth a thousand words,” and in the online world, nothing is truer. Keep the toilet seat down, make the bed, put the kids’ toys away, and clean the countertops. Check your images carefully for things you might have missed when you took them before posting online. Whipping up a rental listing might seem like a daunting task. 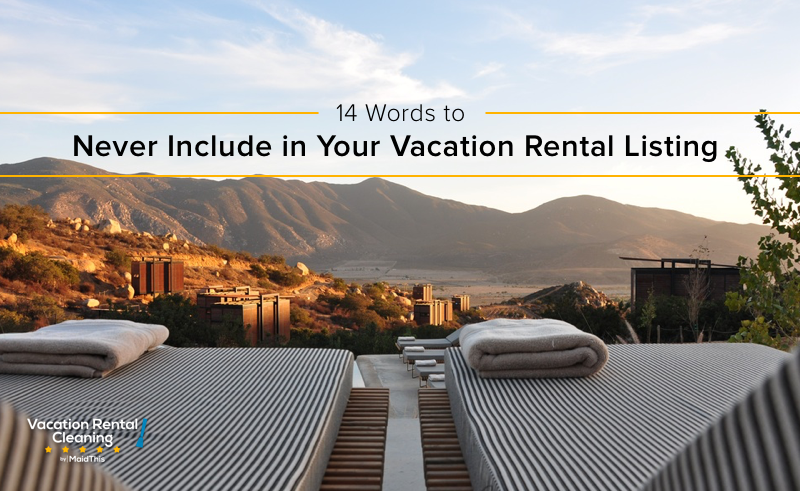 Truthfully, the only thing you need to remember is you are providing the most important thing for vacationers – a place to stay. Do your best to represent your property as you see fit and the rest will follow. Now put out the welcome mat! Need help getting your vacation rental ready for your next guests? Set up a time to have one of our fully-vetted cleaners make your space sparkle and watch the rave reviews stack up.